For those who like to explore the world out there, they know the importance of capturing the memorable moments of their lives. When traveling through all kinds of weathers such as rain or storm, in addition to taking care of our health, the camera and its equipment are the second important things that we need to take care of – especially the cameras – they need to be tough enough to handle all of the situations and record all the worthwhile moments. However, not every camera is tough and durable since some are made only for day-to-day use and some are made for this kind of hardship. Since finding the ideal one for might be a difficult task our team has compiled the 10 best waterproof video cameras on the market today. 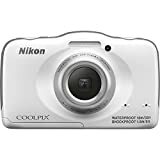 First thing first, we have the best waterproof digital video camera which is the Nikon COOLPIX S32 Waterproof Digital Camera. Unlke most DSLR cameras that Nikon has made, this is the tough digital camera which is made for the explorer since it is equipped with waterproof and shockproof that will surely capture all the moments of your life. This camera can shoot in Full HD 1080P video along with the stereo sounds for the dazzling movies. For the images, this camera also has the high-performance CMOS image sensor which lets you shoot pictures without using flash. Moreover, this camera also has the 3 times wider angle with the NIKKOR glass zoom lens that will capture the full image in a footage. 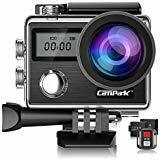 Moving from the digital camera type to the action one which is the Campark Action Camera X20 Waterproof. This is the upgraded version of the Campark ACT74 that features the 20MP that will provide high clarity photos and 4K resolution for the video. Since it is capable of capturing such a high-resolution footage, having one of this camera will surely never let you regret to capturing all the best moments in your life. 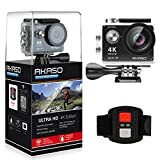 Moreover, for those who like to upload their adventure videos to the social media, this camera will impress all your audience with its stabilization that will deliver the steady and smooth videos to them. 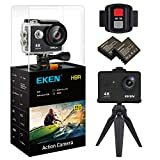 Another great quality water resistance camcorder, we have the EKEN H9R Action 4K Waterproof Camera. With this camera, you can freely share your story with your friends with the best quality to them. This camera also built-in with the WiFi & HDMI output to export your footages to your laptop instantly through the App EZ iCam. It also has the strong WiFi signal as well with the range up to 33 feets. The best thing of all is that this camera is equipped with the waterproof feature by encasing it with the waterproof case and you can freely bring it under the water and capture all the moments. Even more convenient, this camera has the 2″ screen to show the display the video and picture right after you capture them. You will be able to capture all the best moments in your life whenever you go with the APEMAN Action 4K Waterproof Camera. This camera has the 20MP lens that can take higher quality footages with a 4K resolution for the video. It can go waterproof by just encasing it with the waterproof case and you can safely go 40M underwater without any problems. Moreover, it also built-in with the anti-shaking features that will deliver the steady and smooth footages. 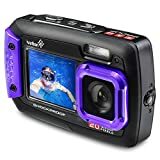 This underwater video camera also features with the WiFi and HDMI output that allows you to share your videos and images to your laptop instantly and easily. Here we have the classic Kodak PIXPRO SP1 Explorer Pack Action Camera. With almost a hundred years of experience in this field, this camera will capture all the best moments of your life on your adventure. It has the advanced CMOS sensor to gives you more speed and clarity than the traditional CCD sensor. The body itself is waterproof and you can bring it underwater within the depth 10m and it also equipped with shockproof and freezeproof as well. Due to all of these benefits, this camera is the ideal choice for those who often go on adventures to the deep jungle and any hazardous places. Capture all the best moments of your adventure with the Victure Waterproof Underwater Action Camera. This waterproof pocket camcorder has the compact body for easy storage and consumes less space in your backpack. It is also capable of capturing the 4K video and 16MP photo resolution. There is the built-in wifi connection for you to share your footages from camera to your laptop, smartphone, and tablet for storage through the app CamKing and OKCAM. For the depth capability of this camera, it can withstand around 30m underwater after encasing with the durable waterproof case. Next, we have the Crosstour Action Underwater Camera 4K that can capture 170-degree wide angle with a 4K resolution for the video and 16MP for the image. Due to such a wide range lens, you can capture a more completed image in a single footage. It also comes with the Wireless wrist remote control to make thing more convenient for you that you can control your camera after pressing the button. 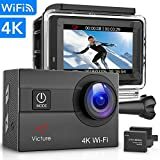 Moreover, this camera also features the WiFi connection that allows you to share files from camera to laptop or smartphone easily and instantly. Plus, this camera also comes with two rechargeable batteries to let you extend the life of the camera and record longer footages. Here we are at the top third waterproof video camera which is the AKASO Brave 4 4K Action Camera. This is the upgraded version of the previous model that allows you to do more on this model. It features the ability to shoot at 4K resolution in 24fps and 2K in 30fps while the 1080P at 60fps. It has the compact body for easy storage and takes up less space in your backpack. 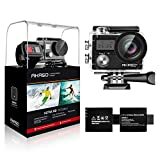 This waterproof pocket camcorder also features with the anti-shaking that will deliver the more steady and smooth footage. And, you can also bring it underwater after encasing it with the waterproof case that can withstand with the depth of 100 ft.
For the Ivation 20MP Underwater Waterproof Digital Camera is rugged and slim with a compact size that allows you to easily bring it along. It also is waterproof, shockproof, and dustproof as well which will definitely capture all the moments even under any kinds of harsh weathers. It is equipped with the dual full-color LCD Display with the rear has the size of 2.7″ and the front facing has the size of 1.8″. It also accepts the external microSD cards up to 32GB so that you can store more footages inside it. Saving the best for last, we have the AKASO EK7000 4K WIFI Sports Action Camera. This AKASO can record the video in the 4K resolution in 25 fps and 2K in 30 fps and for the photos; it can capture 4 times resolution of the normal HD camera. This camera also has the waterproof features as well that you can go underwater for 100 feet once you encase it with the waterproof case. Moreover, its built-in WiFi and HDMI output allows you to export your files from the camera to other devices easily and quickly. 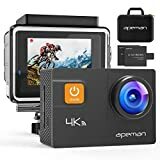 If you are planning to go your next adventure and your old camera seems to not work well anymore, then these ten waterproof video cameras are the ideal choice to replace that old one. With these cameras, you will be able to capture all the best moments of your life with your beloved people awesomely. Get yours soon whilst stock lasts.